The Spanish government, trapped in crossfire at the frontline of the battle for the euro, looks as if it is opening a second front – by using the crisis as pragmatic justification and political cover to roll back a highly devolved system of regional government that the ruling Partido Popular ideologically detests. The centre-right PP, which won power last November, wants not only to shrink the state but also to recentralise it. The government of Mariano Rajoy has been dropping hints and throwing its weight around with regional governments – several of which need Madrid’s help to pay their staff and refinance their debts. 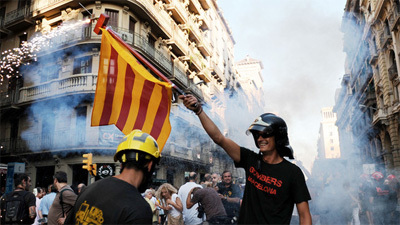 “We are part of the state but we are treated as subjects not partners,” Andreu Mas-Colell, finance chief in Catalonia’s nationalist government, complained to the Financial Times days after a bruising meeting with Cristóbal Montoro, the Spanish finance minister, whom he said threatened to impose central control on regional governments that missed rigid new budget targets.